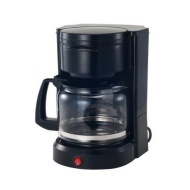 alaTest has collected and analyzed 18 reviews of Matsui M12FCB09 Filter Coffee Maker. The average rating for this product is 4.6/5, compared to an average rating of 4.4/5 for other products in the same category for all reviews. Comments about the performance and size are generally positive. The maintenance and usability also get good views. Reviews are divided on the capacity, while there are some critical comments about the noise. We analyzed user and expert ratings, product age and more factors. Compared to other products in the same category the Matsui M12FCB09 Filter Coffee Maker is awarded an overall alaScore™ of 82/100 = Very good quality. Components are all easy of access for use, removing and replacing and are simple to clean. Coffee grounds do not accumulate. It has no scale to measure the amount of water to put in for the number of cups of coffee required. Attractive style, large mouth carafe for ease of cleaning. No markings for measuring water. This unit is great value for money, and extremely quick and easy to use. At such a bargain price this is tremendous value for a coffee machine which probably produces just as good coffee as one with lots of digital gizmos. Coffee grains can sometimes splash up under the water outlet., but this is not at all a serious fault. It makes a lot of coffee and has large capacity jug. Amazing, amazing, amazing :) And it was such good value for money!